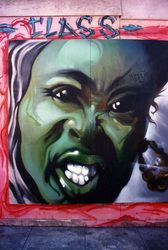 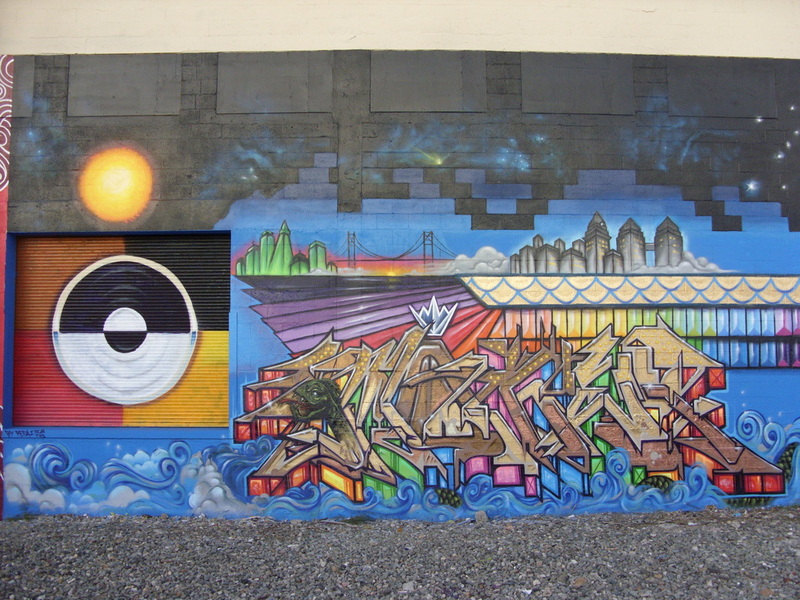 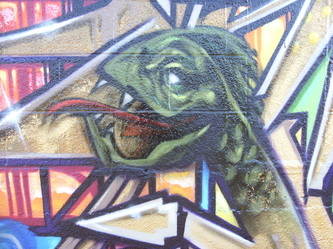 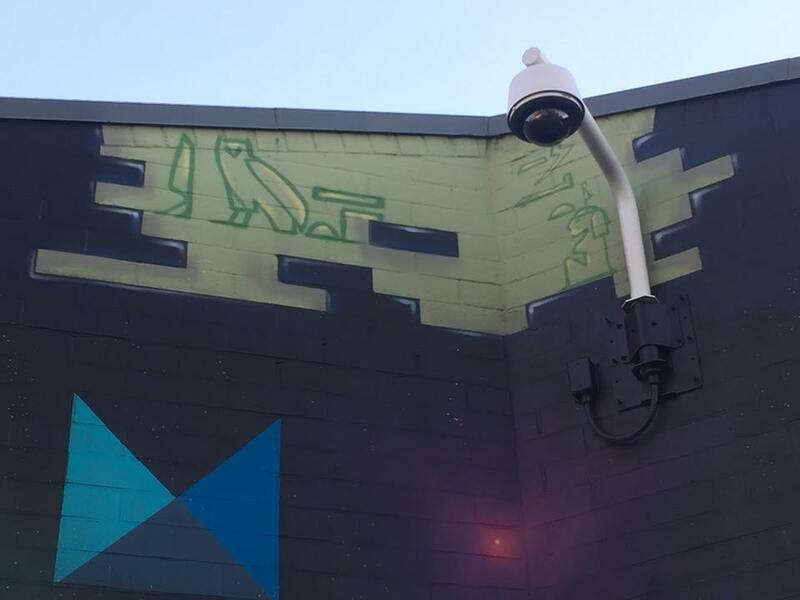 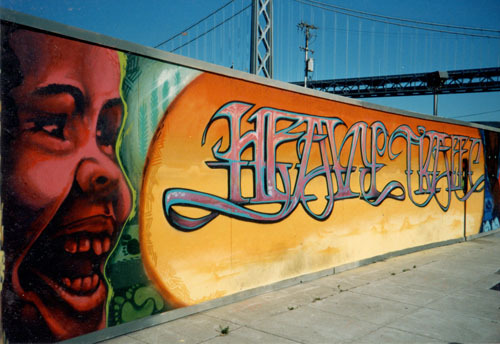 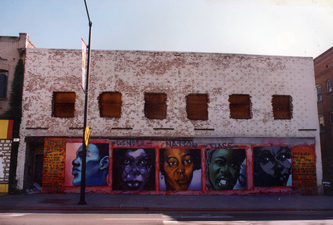 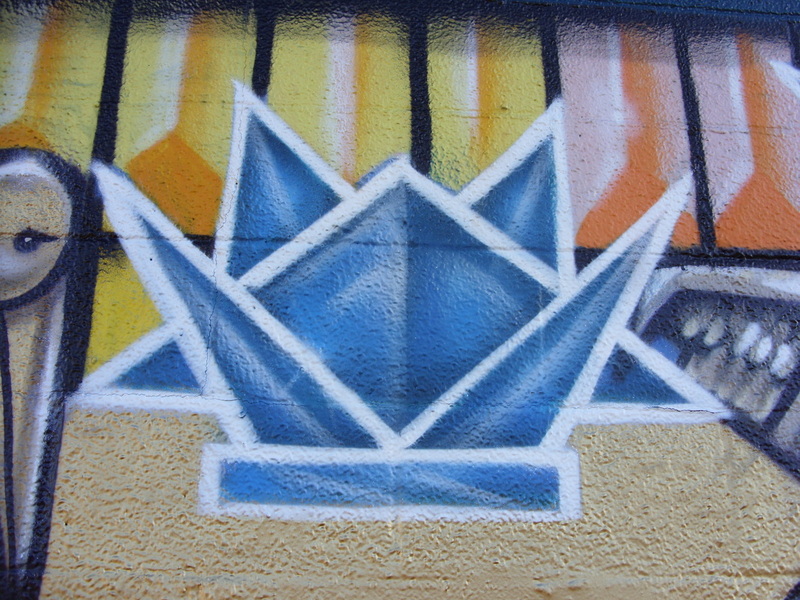 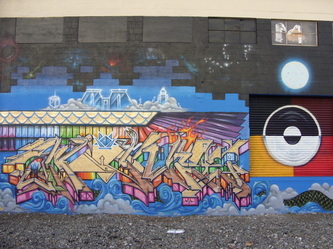 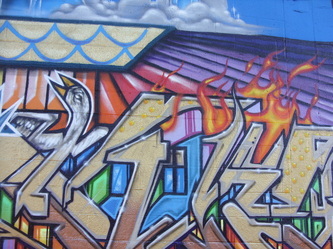 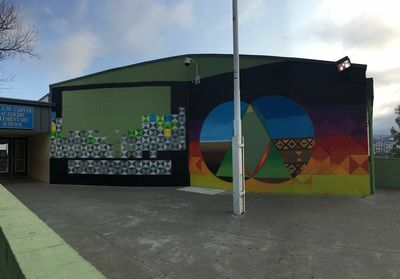 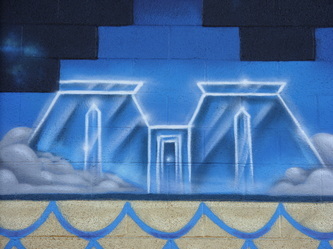 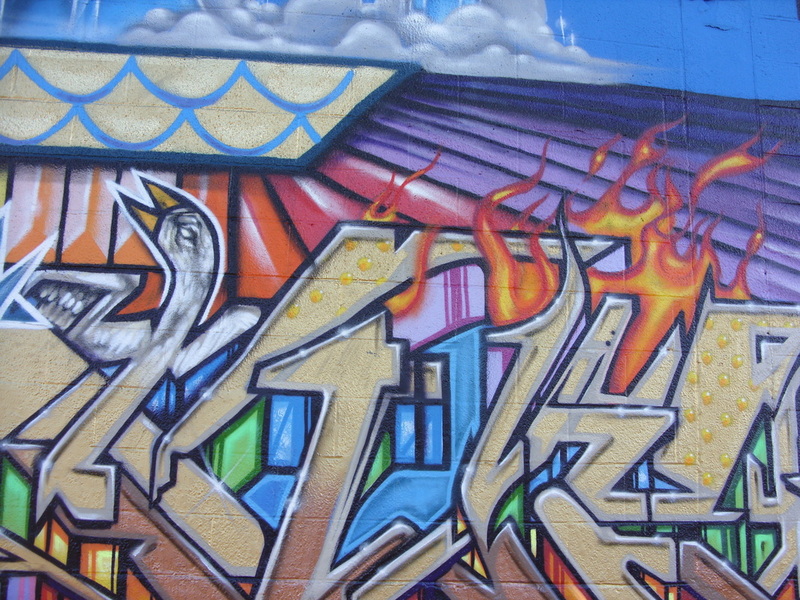 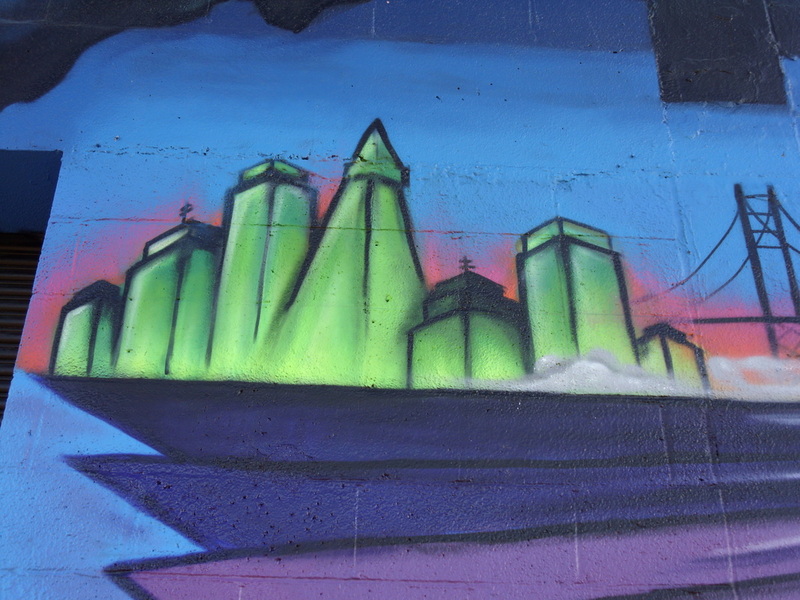 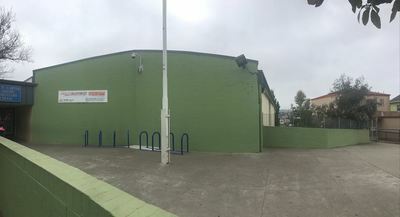 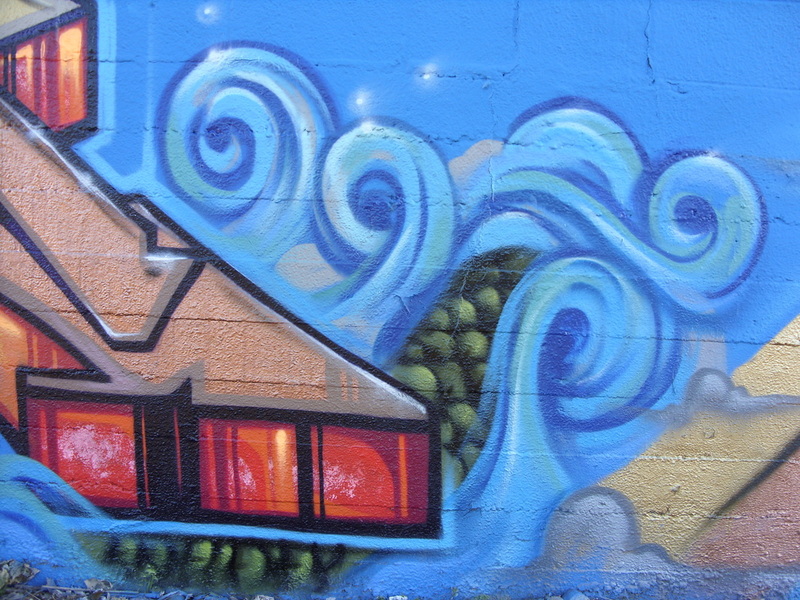 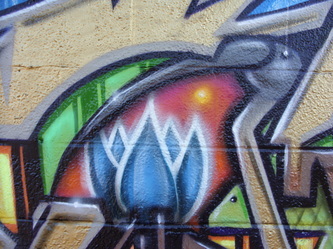 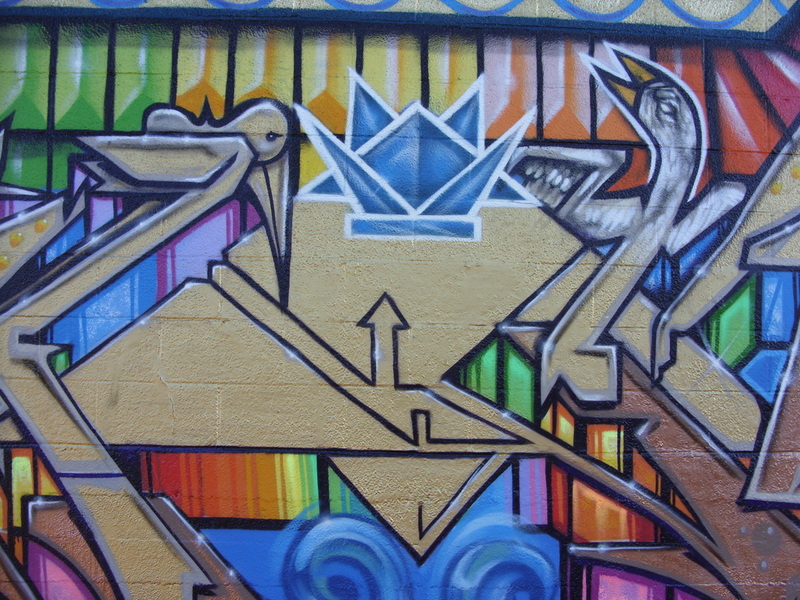 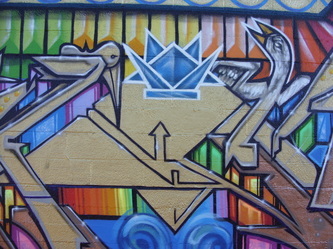 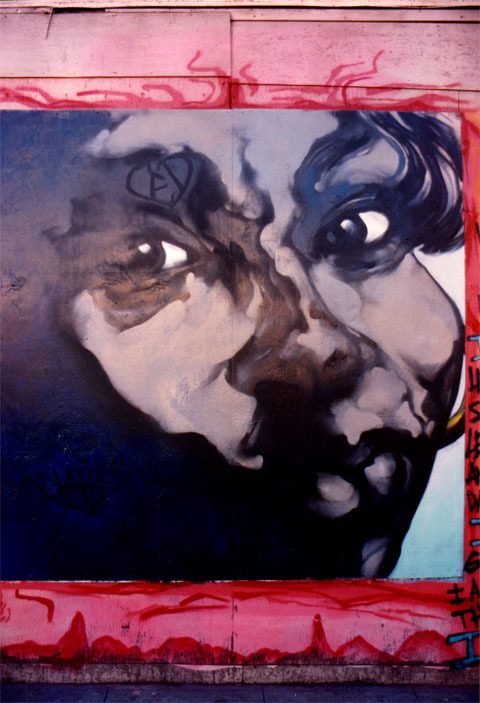 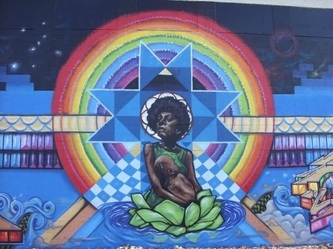 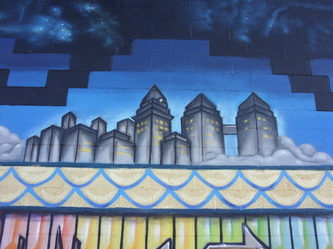 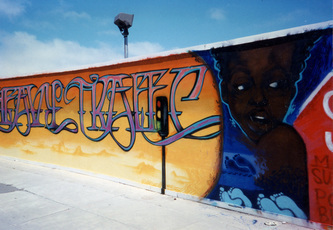 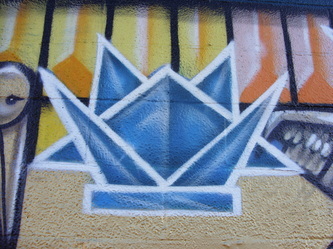 "The Forces of Nature" was commissioned by The City of Oakland in an attempt to remove tagging vandalism from a warehouse wall facing the 880 Freeway. 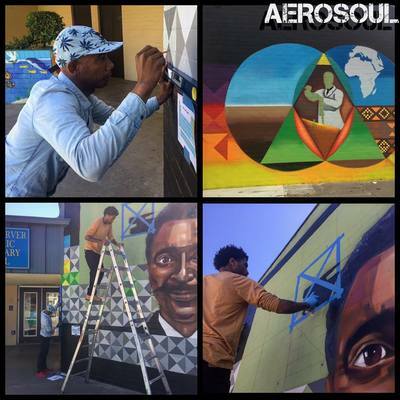 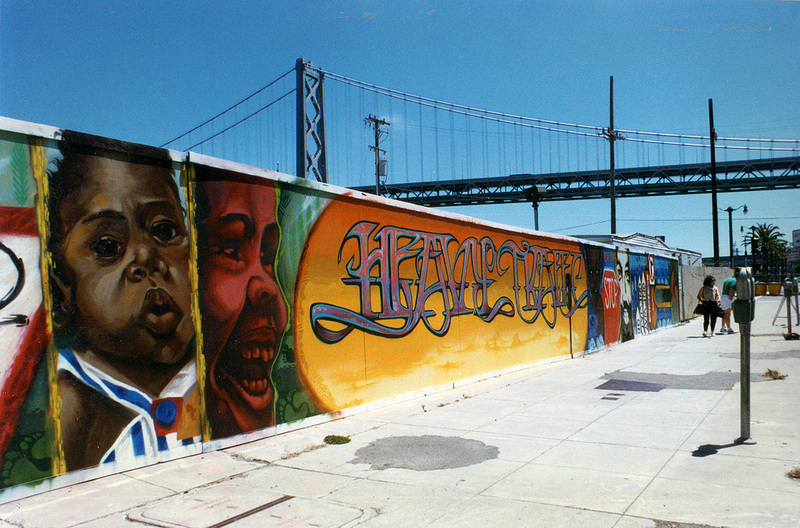 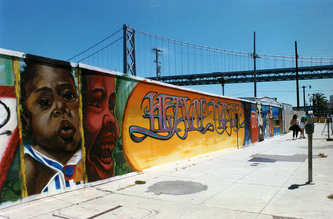 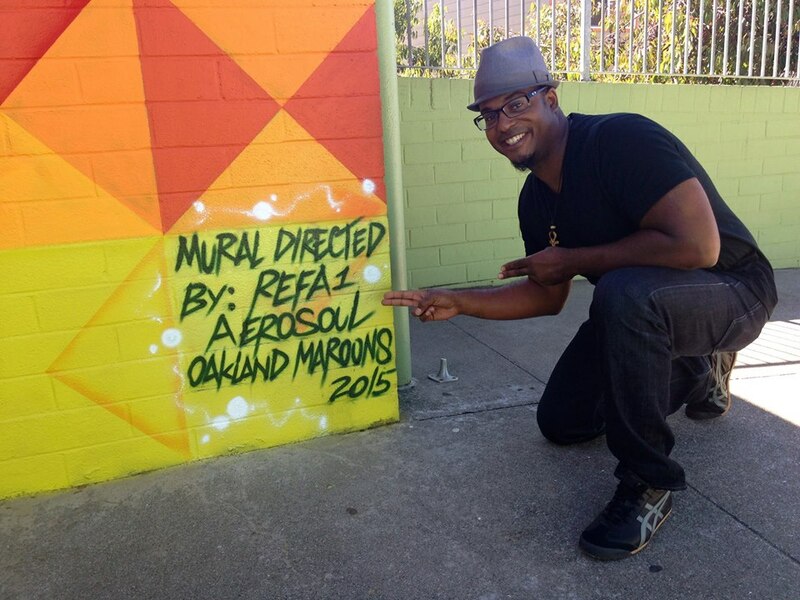 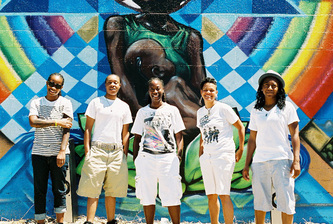 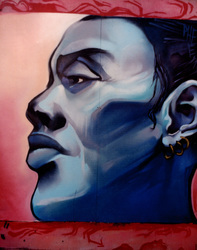 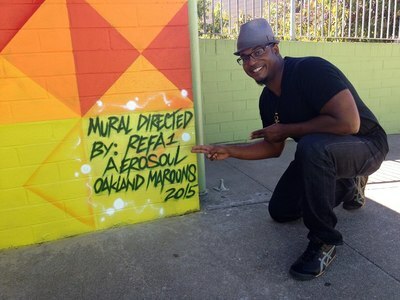 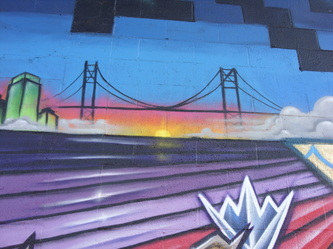 The Mural was designed to be a welcoming beacon into the city of Oakland as people travel into downtown from the Oakland airport. 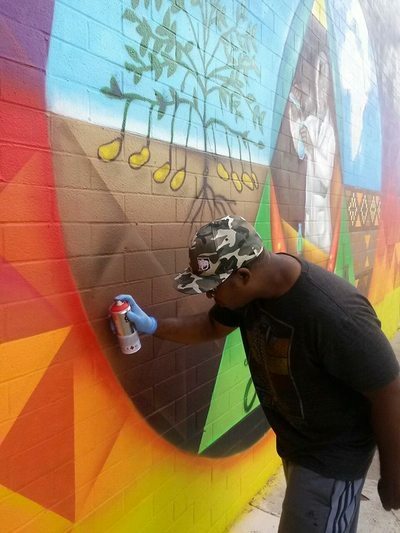 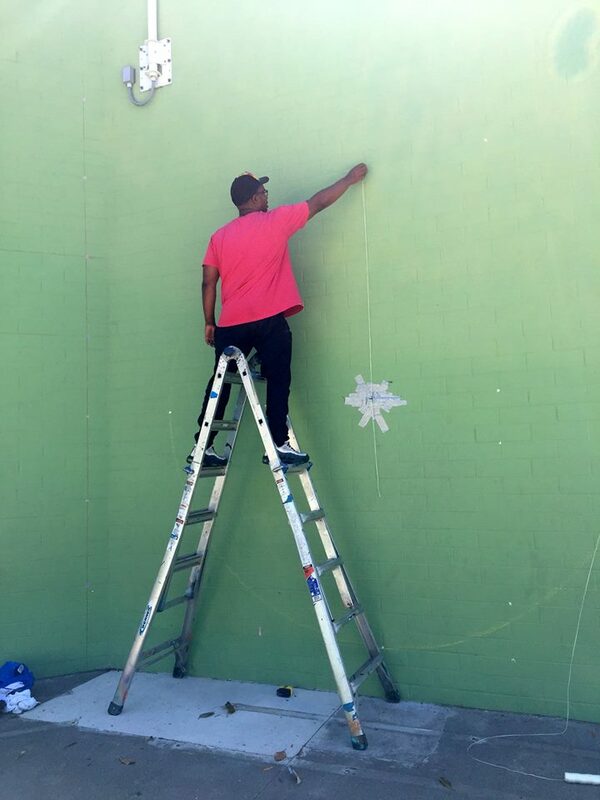 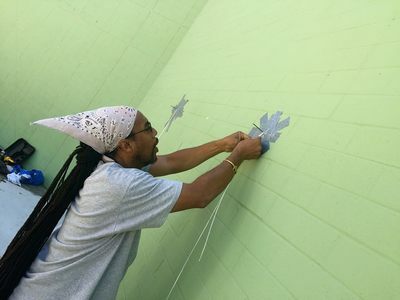 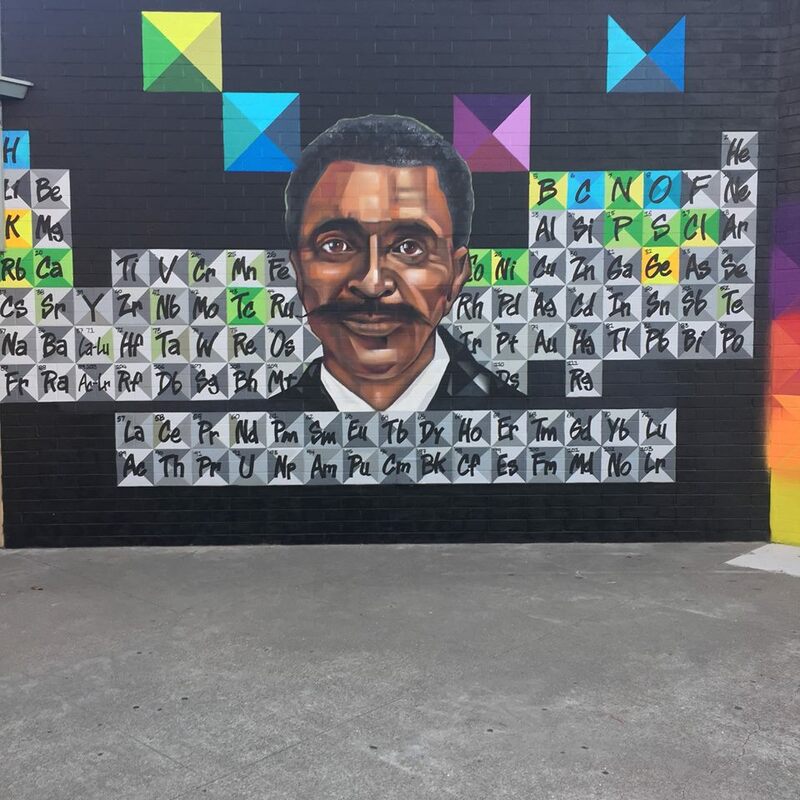 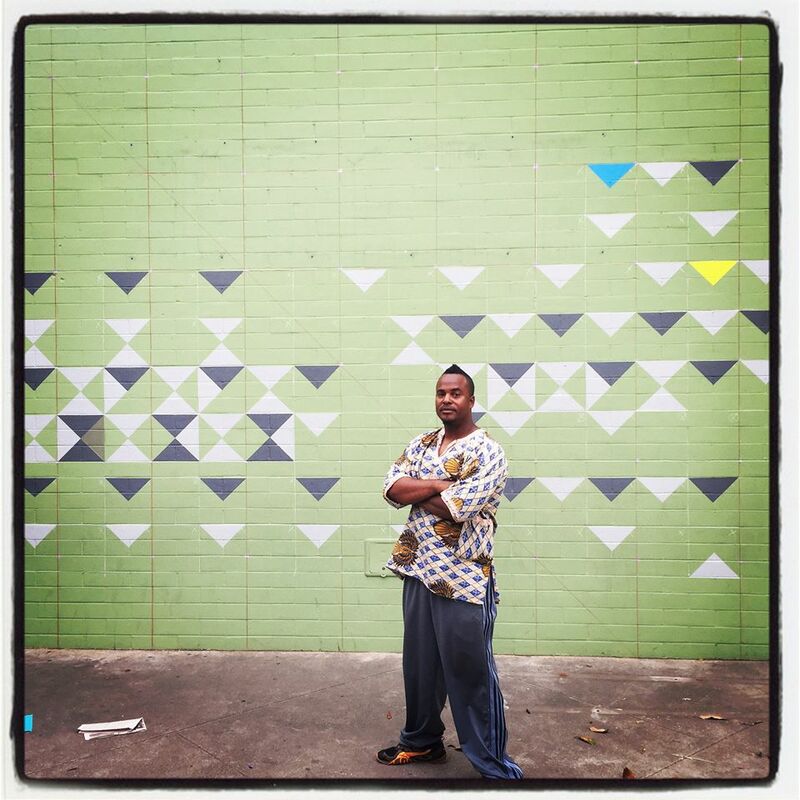 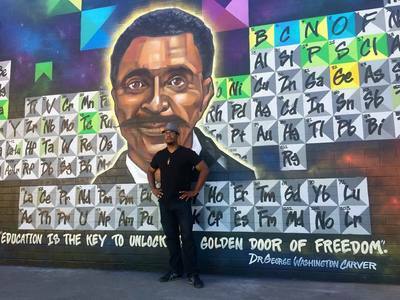 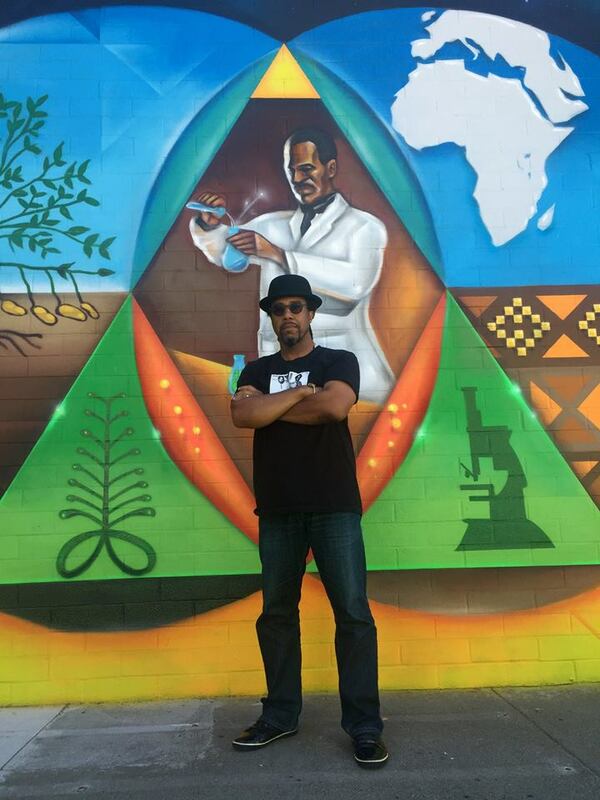 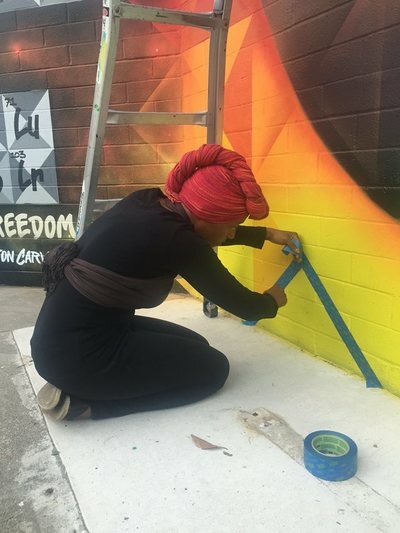 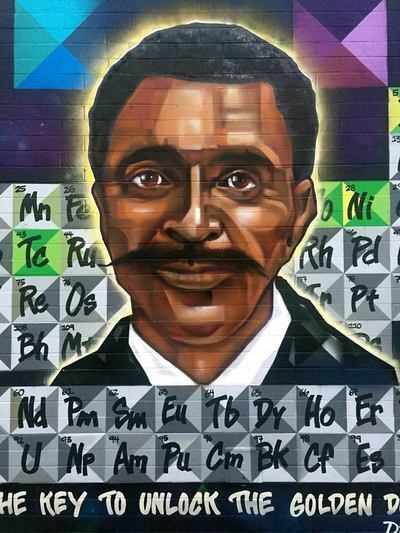 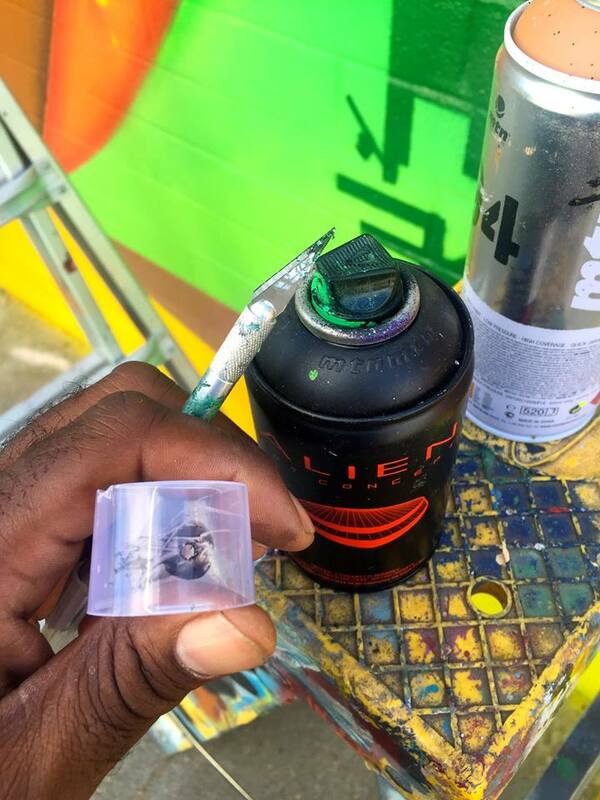 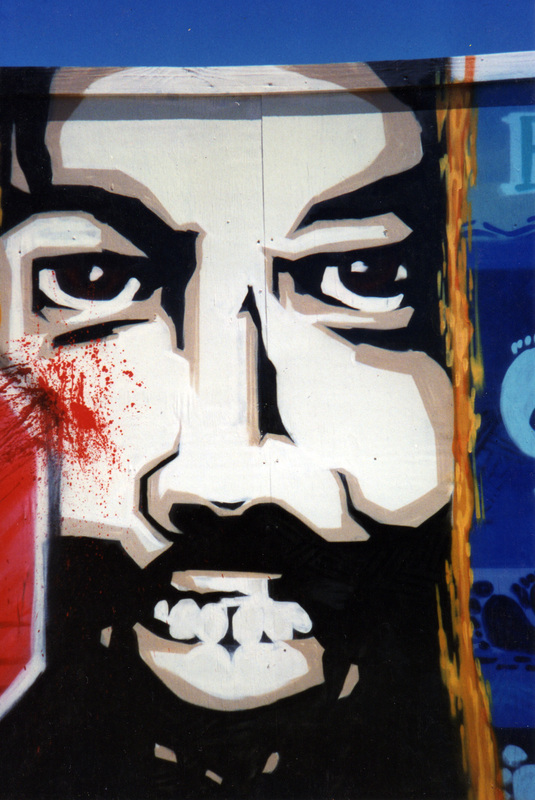 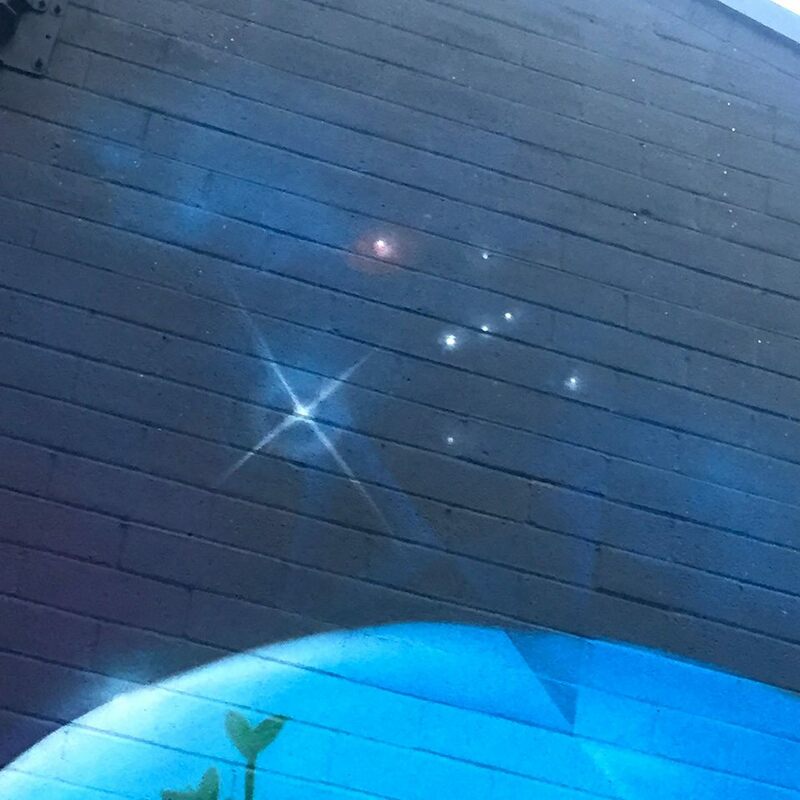 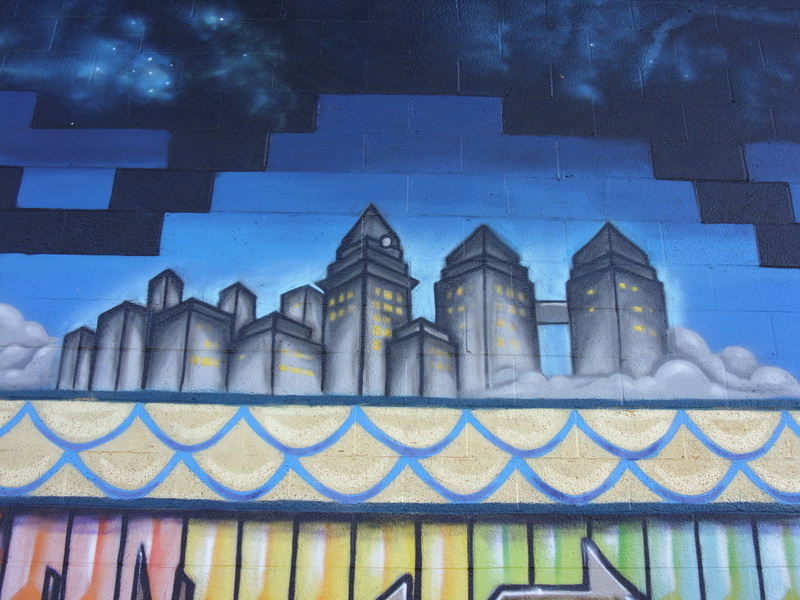 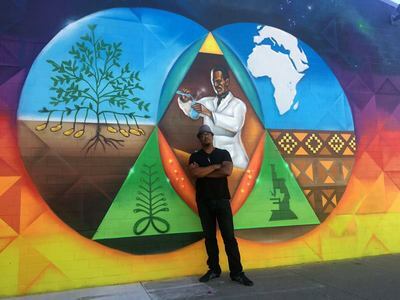 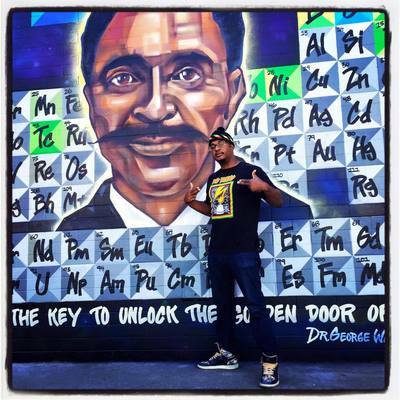 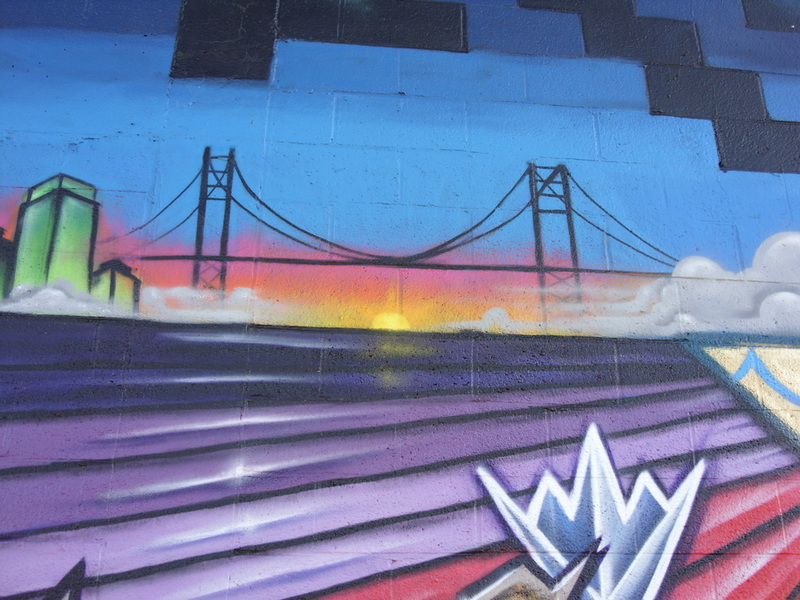 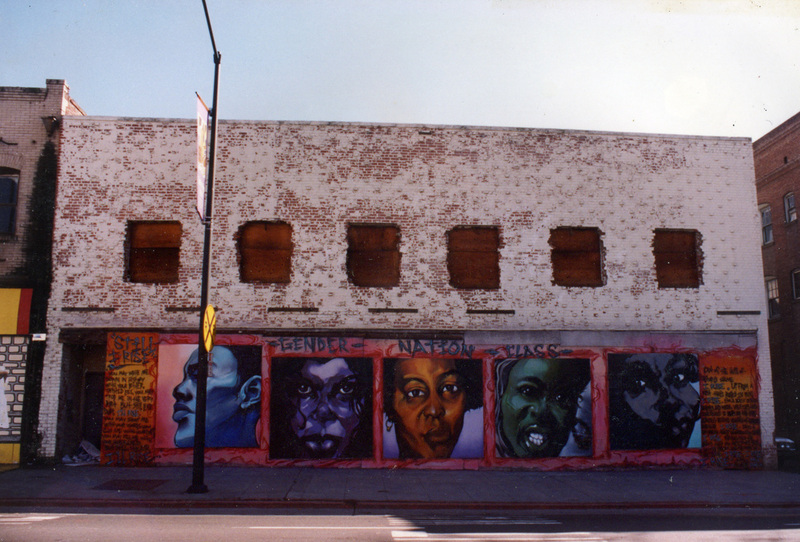 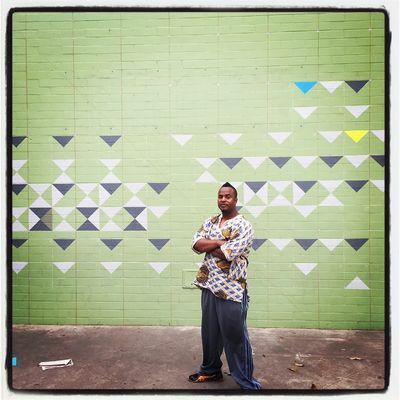 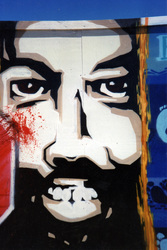 Given the predetermined subject of nature by the city and the property owner I felt it necessary in the times we live to compose a mural that spoke to concerns affecting the community. Creativity in concept as well as design were of utmost importance,I didn't to create another nature landscape mural typically associated with the topic. I decided to personify nature in the form of Mother Nature and focus on the beauty,gifts offered to us by the creative Mother. 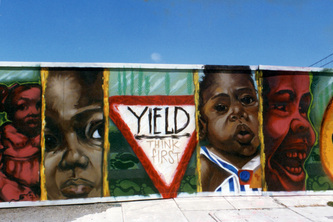 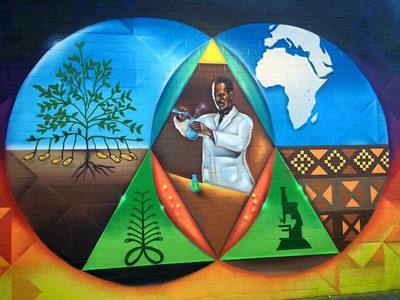 The Mural serves as a reminder to the community about how much we need to cherish our greatest resource, our children. 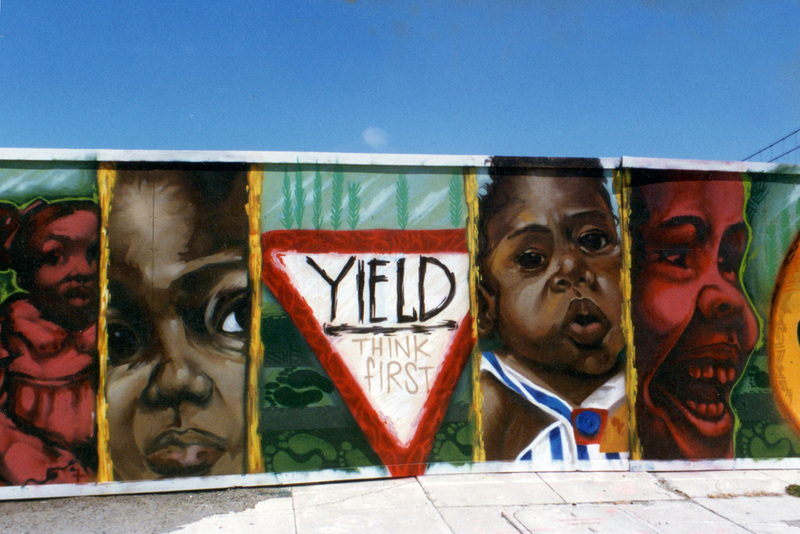 Cosidering the fact that Oakland looses the lives of over 100 young people(mostly Black males) a year to violence, I felt it was urgent to create an image to help direct our attention to preserving precious life. 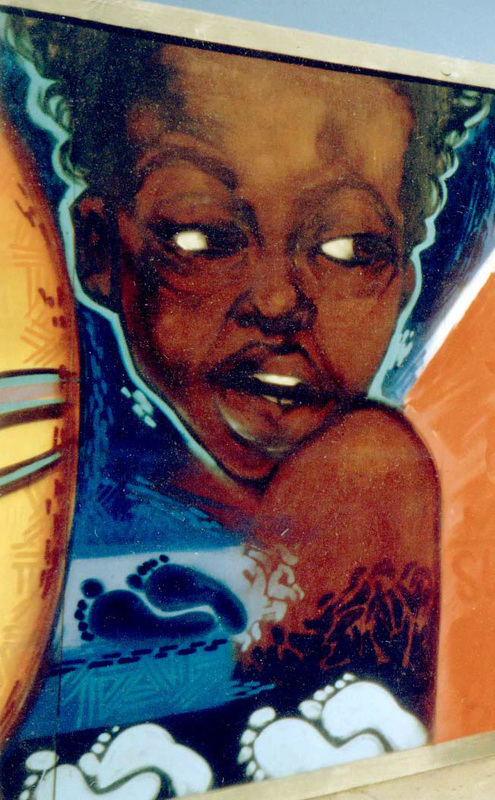 Those sons lost are connected to Mothers who deserve the right to raise healthy,loving families. As the lead Artist I was able assemble a small crew of artist to help me with the task of bringing the 2 month long process to light. Chris Herod,Toons and members of the TCB and AeroSoul collective were responsible for supporting me in the completion of this vision. 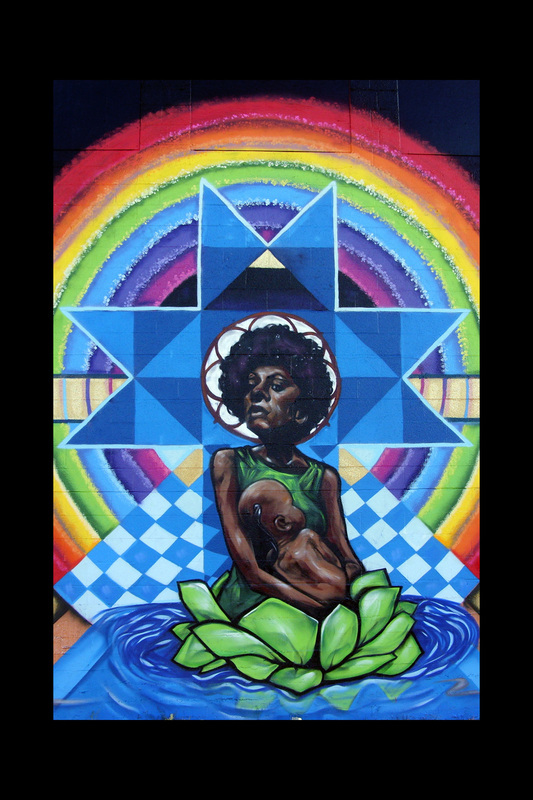 "The Forces of Nature" now stands as a beacon for spiritual,harmony,growth and community as well as environmental preservation. 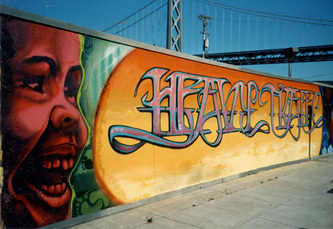 SanFrancisco Arts Commission and Bectel. 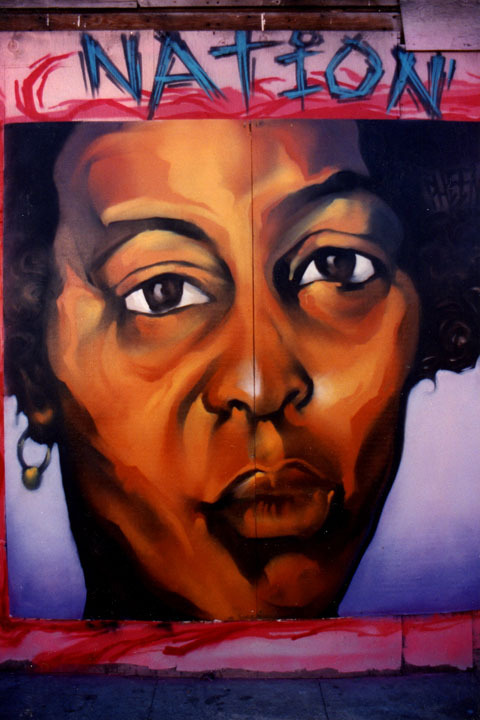 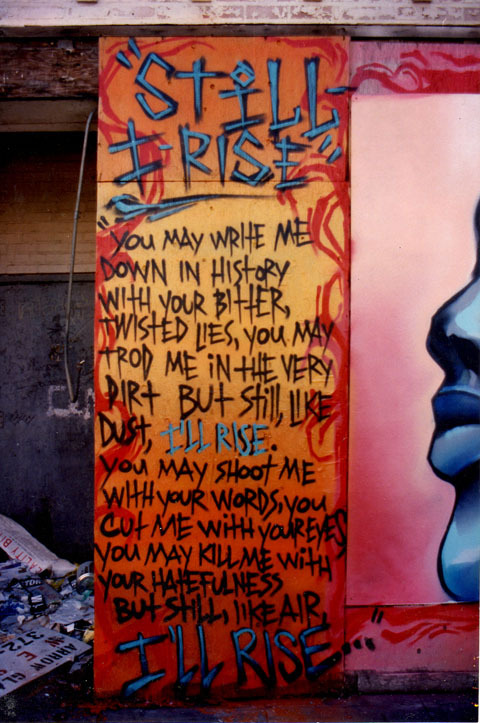 This Mural was inspired by the Legendary Maya Angelou, her contribution to the betterment of our community is immeasurable. 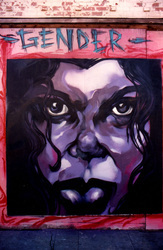 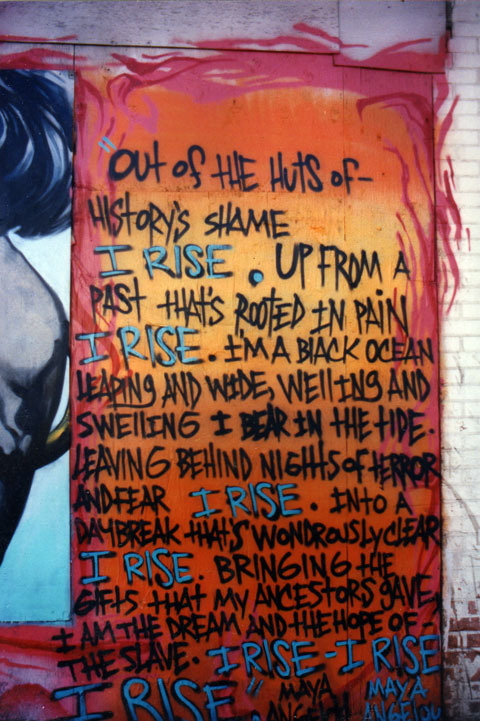 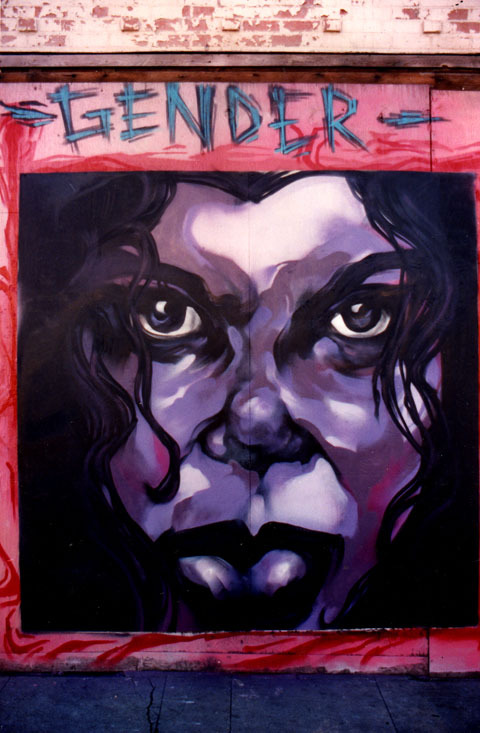 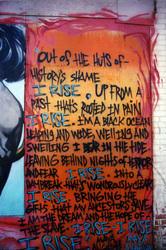 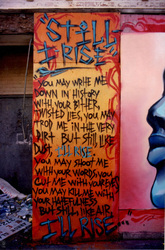 Her Poem Still I Rise set the tone for the Mural theme.